Two million years ago, ape-man “Lucy” jumped off a tree on the African savanna—— “human being” walked upright for the first time in history. 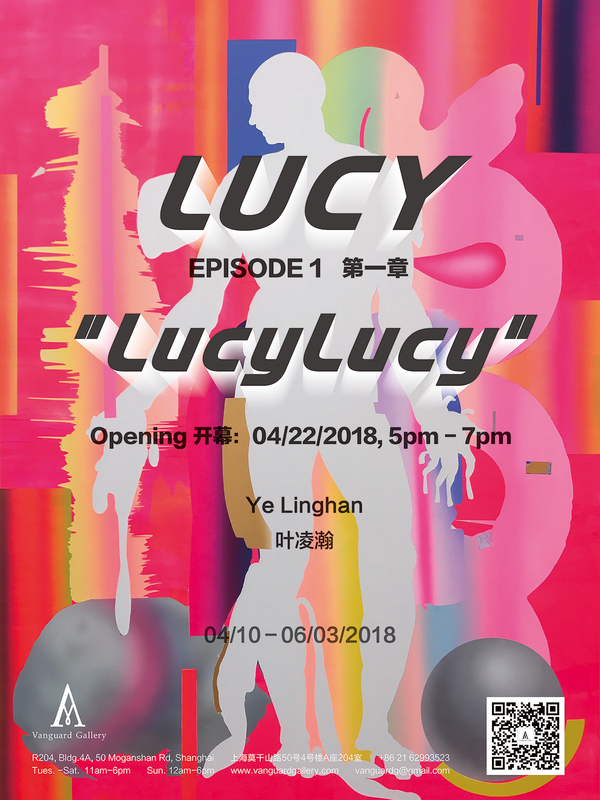 Inspired by the BBC documentary Origins of Us, Ye Linghan employed the most famous human ancestor “Lucy” to be the protagonist in his artistic narrative, to elucidate the evolving recognition and self definition of us as human beings though paintings as well as potentially other mediums in the future. From the human-like ape Lucy to the fictitious human-like stage that each individual enters as we slip further into the internet era, consciousness and concepts are being coded into the virtual world. —— We evolved into a whole new type of human being through data flows and acquired a new identity which folded across race, sexuality and geopolitics. In the “lucylucy” series as we presented in this exhibition, the artist believes painting is a stochastic outcome based on virtual experiences: With colors in 64-bit RGB forms and techniques with electronic features, fragments of memory that came from browsing history become layers as the basic elements layering up. Ye flattened a selection of images off the internet, layered and clustered them around a left-black human figure in the center, as if layered sketches of various virtual identities of the same individual in the cyber world.—— As the artist stated banteringly himself, such style of painting is called internet sketching, a Neo-Futuristic style of painting. “lucylucy” is you in reality, is you in the virtual world. “lucylucy” is you on the user interface, is our ancestor “Lucy” or Hatsune Miku. “lucylucy” is us jumping off a tree once again. —— Everything is brand new. Born in Lishui, Zhejiang in 1985, Ye Linghan graduated from China Academy of Art in 2009. His works are mostly based on animations, with strong symbolic features and fragmented processing of temporal and spatial sense. 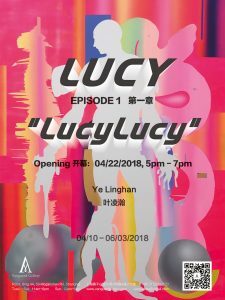 Recent exhibitions include: Bi-City Biennale of Urbanism\Architecture, Shenzhen, China(2017); Fantasy Creator, chi K11Art Museum, Shanghai，China(2017); Expiration Date of A Home, JNBY, Beijing, China(2017); Self-cultivation—The Personal Technology of Living Soma, Ying Art Center, Shanghai, China(2016); Pixel Park, Jiangan Sculpture Park, Shanghai, China(2016); Warehouse Story Ⅴ, Vanguard Gallery, Shanghai, China(2016); The Suggestive Wheel: An Era of Metaphors, Boxes Art Space, Shenzhen, China (2016); Animamix Biennale 2015-2016—Space In Mind, MOCA, Shanghai, China (2016); We-A Community of Chinese Contemporary Artists, K11, Shanghai, China (2016).